Vercelli is a city and a province in the region of Piemonte; the city is the provincial capital and is located at 130 m above sea level, on the eastern side of the river Sesia. It is the most important urban centre in the lower Po valley, surrounded by farmland and views across paddy fields. The old city center with its medieval streets was built on a pentagonal plan; its subsequent expansion led to the formation of a concentric settlement pattern with linear expansion along two transportation axes towards Turin, Biella, Casale Monferrato and Novara . Vercelli still has several Roman remains, such as the amphitheater, the racetrack, sarcophagi and numerous important inscriptions, including many Christian ones. There are two tower worth mentioning: the Angel Tower and the City Tower, in via Gioberti. Vercelli’s cathedral richly adorned with columns and mosaics, was built and extended by Saint. Eusebius of Vercelli, to whom it was dedicated after his death. It was modernized in the 9th century, and completely renovated in the 18th century by Count Alfieri. The cathedral and other churches in the city house numerous valuable paintings, many by Gaudenzio Ferrari. The cathedral was rebuilt on the site of Saint Eusebius’ church/basilica in 1572. 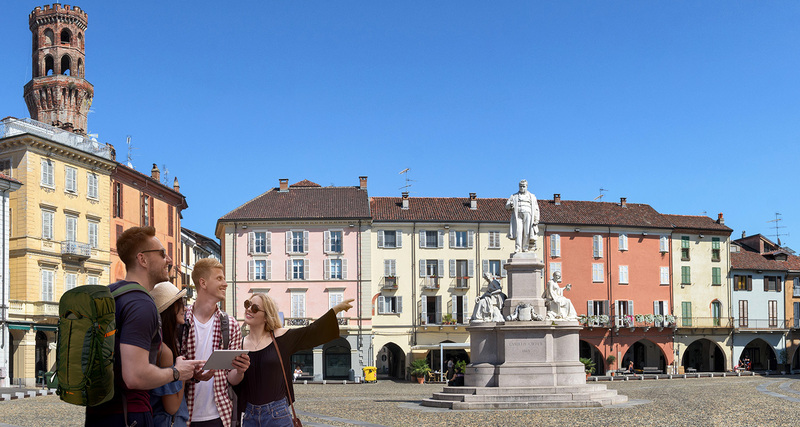 Vercelli is definitely one of the richest cities of Piedmont with its treasures and masterpieces of art, with a lovely old town and museums of international importance. It’s an important stage of the Via Francigena, with frequent passages of pilgrims and lovers of art and it’s part of one of the most peculiar landscape of Europe, that of the “land of water”, the rice fields. In Vercelli take also place a lot of cultural events, such as Viotti Festival of classical music, that every year brings violinists from all over the world and the cycle of Guggenheim exhibitions, located inside a Church of the thirteenth century. Departing from Torino, our first stop will be the Basilica of Sant’Andrea, then we’ll reach the Visconteo Castle, Piazza Cavour, Piazza dei Pesci e il Broletto and the Synagogue. During the tour we can agree to visit some of the beautiful museums, such as Camillo Leone Museum, Borgogna Museum and Museo del Tesoro del Duomo. We can agree to have lunch in a restaurant of the old town to taste food and wine specialty of the territory.